Some years ago, the musical, Miss Saigon, hit Broadway and the West End in London. It's the story of a reluctant Vietnamese prostitute and an American GI who fall in love right at about the time of the fall of Saigon in 1975. He manages to escape but leaves this woman behind, who happens to be pregnant with their child. The rest of the story is about her hope that they'll be reunited again one day and the different circumstances that lead to their attempt to make that happen. The musical was inspired by a photo that the musical's composers came across - it is a black and white picture of a mother who sacrifices her place on one of the last flights out of Saigon so that her children can come the the United States. The woman is crying as her children say goodbye, huddled around her, hugging her. If pictures are worth a thousand words, this one is worth ten thousand. In this mother's face, you can see the utter anguish she feels at the thought that she may never see her children again because of the political situation in Vietnam at that time. Her countenance at once displays a sense of joy at knowing that her children will have a better life in America and yet a deep sense of sadness that her beloved children and she may never be reunited. She is totally torn apart. Ask any mother present here and they will tell you that the closest bond they have ever felt with another person has been that which they have shared with their child or children. The bodily communion that mother and child share is often described by psychologists as being even more intimate than that between husband and wife. If this is true, then it shouldn't be any surprise that of all of the dozens of titles ascribed to the Blessed Virgin Mary, the title of Theotokos or God-bearer or Mother of God is the highest and most sublime. It is this title that dates all the way back to the 2nd Century. Today's Solemnity has a very ancient history. In the year 431, the Council of Ephesus (in modern-day Turkey), thanks to the help of St. Cyril of Alexandria, declared that in fact, Jesus Christ, as true God and true man did have a human mother, known as the virgin Mary and that it was from her that the Christ took real flesh in real time in order to share in our humanity and redeem us. This declaration came about as a result of a debate promoted by a bishop, by the name of Nestorius. Nestorius was convinced that although Mary should be esteemed, neither she nor any woman could truly be the mother of God because God cannot have a mother. Nestorius also held that Christ did not take on our human nature and was only divine. Hence, Jesus would have no need for a human mother. St. Cyril of Alexandria, took the opposite position - that in fact, if Jesus is true God AND true man, then to declare Mary as the Mother of God is not only appropriate, but true. It is Mary who gave Jesus his human nature and gave him His human formation as he grew into manhood. This Council, which solemnly defined Mary as the Mother of God, took place in Ephesus, which is found in present-day Turkey where our Lady is believed to have spent her last days. The exact area within Ephesus believed to be her residence is in a small cluster of about 15 homes. Fourteen of the 15 homes have three equally-sized rooms on the ground floor - a kitchen, a living room and a dining room. Mary's home, however, is rather unique. It has a very small kitchen and dining room, but a very large living room. The tradition holds that Mary's living room was uncharacteristically spacious because she would host people who came from all over everyday to listen to her talk about Her Son, our Lord. This large reception area is an invitation for us to sit at her feet and listen to her talk about Jesus. What did Mary talk about? She probably shared some of those stories that St. Luke describes as the things that Mary reflected on in her heart, from our Gospel reading. Mary knew Jesus longer than any other human being. Our Lord spent most of His life with our Lady and practically all of these years go unrecorded in the Gospels. This is known as the period of the hidden life of Jesus. 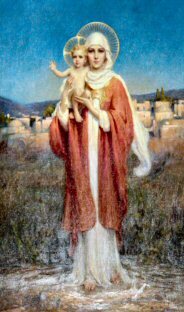 Mary helped Jesus cultivate all of the virtues that would constitute the very depths of his sacred humanity. It was she who taught our Lord, in his human nature what it means to address God the Father as "Abba" as St. Paul describes in our second reading, from Galatians. If you read the lives of the saints, you will discover that a common thread among so many of the saints is that each of them maintained a very strong sense of being a son or a daughter of God the Father. It was Mary who taught Jesus how to cultivate this relationship. It may explain why Jesus is found on several occasions spending an entire night in prayer, communing with the Father. Catholic spirituality has often equated this sense of Mary's reflection on these things that she ponders in her heart with an overall spirit of recollectedness. What this means is having a sense of deep interior peace and trust that God's Providence directs the course of our daily lives. It implies having a sensitivity to the work of the Holy Spirit in our souls. Persons with a sense of recollectedness are often quick to withhold judgment, ready to forgive, humble in recognition and acceptance of their state in life, and never petty or quarrelsome. If this is what it means to be recollected, then I think we would all agree that the world could use many more people like this. This is exactly who our Lady was - always living a state of recollectedness that allowed her to be open to God's plan in her life. People who are not recollected are often so very full of themselves and leave no room for God. After awhile, they become their own God since all they say and do and think appears to them to be self-generated and completed only by their own skill and ability. Grace has no real place for such a person. As much as we honor Mary as the Mother of God today, we can't help but acknowledge that she is also our mother. At Calvary, Jesus intended to make this evident, when he turns to St. John (and consequently all of us) and says, "Behold your mother." The Pope writes that in this moment, Jesus is not merely asking St. John to do him the favor of watching for his mother. After all, the presence of relatives of Jesus in the persons of the other women present at the Cross would have solved this problem. Much more is going on - the Pope states that it is not so much that Jesus entrusts Mary to John but rather - he entrusts John (and all of us) to Mary. By entrusting the human race to Mary at precisely the moment when He is about to die, Jesus completes His saving act of Redemption. He entrusts us to the very woman who helped form his sacred humanity so that she could teach us the very depths of what it means to be fully human - to be a saint. As we commence another calendar year, the Church continues to exhort us to cultivate a Marian spirit. In fact, the Holy Father declared October 2002 to October 2003 to be the year of the Rosary. If we are not in the practice of praying the rosary daily as a family or as a couple, it is time that we return to this ancient and revered devotional practice. Mary has no other desire than to lead us to her Son - we can answer that invitation by spending time meditating on her life and the life of Her Son through the 20 various mysteries of the rosary. As the New Year approaches, we entrust ourselves more than ever to the protection and patronage of Mary. It seems as if the stage is set for 2003 to be a very important year in world history. We may go to war in the next twelve months; our economy may continue to slide; we may be subject to more terrorism. As uncertain as the future may seem at times, it is always comforting to know that we have a mother who truly intercedes for us - who identifies with all of our fears and longings. And like that Vietnamese mother who only wanted what was best for her children, Mary remains our mother who knows what it means to suffer with Christ and a mother who desires nothing more than what is best for her children - life in the Trinity and the eternal reward of heaven.